The global HAZMAT packaging market was valued at US$ 8.10 Billion in 2018 and is projected to expand at a CAGR of 5.8%, during the forecast period. HAZMAT packaging refers to the packaging of hazardous materials that are capable of posing risk to health, safety, or property during transportation. HAZMAT packaging has emerged as an efficient way to protect environment from hazardous chemicals. The scope of this report includes primary packaging of hazardous materials and includes packaging of products through drums, flexitanks, industrial bulk containers, etc. The packaging done with corrugated boxes is a part of secondary packaging. HAZMAT packaging is usually meant for the storage and transportation of hazardous substances across the border. Shipping of such materials is not only dangerous but also requires adherence to the guidelines and regulations set by organizations such as U.S.DOT, IMO, IATA, and ICAO etc. There are nine classes defined under HAZMAT packaging. These include explosives, gases, flammable liquids & solids, oxidizing substances, corrosives, toxic & infectious substances, etc. HAZMAT packaging solutions are designed to protect the cargo from explosions or leakage. The basic shipment description required for HAZMAT packaging consists of shipping name, hazardous material classification, identification number, and the packing group respectively. Labelling & marking are the two primary constituents that play a vital role in the HAZMAT packaging market. Improper HAZMAT packaging results in severe injuries or loss of human life as well as damage to the environment. Controlling exposure to occupational hazards is the fundamental method of protecting workers, in case any hazmat incident occurs. The growth of HAZMAT packaging is mainly driven by the need for safe and secure packaging solutions. Spilling and snapping of cases can be minimalized by using HAZMAT packaging. HAZMAT packaging is reliable as it ensures the safety of crude during transportation by rail or other methods. Moreover, manufacturers and retailers find it difficult to get their products to the market efficiently. HAZMAT packaging plays a crucial role here. Also, many packaging manufacturers are opting for e-retail as a means to not only increase their sales, but also to maintain a competitive edge over other market players which, in turn, increases the demand for HAZMAT packaging. The global HAZMAT packaging market has been segmented on the basis of product type, material type, class, end-use industry, and region. 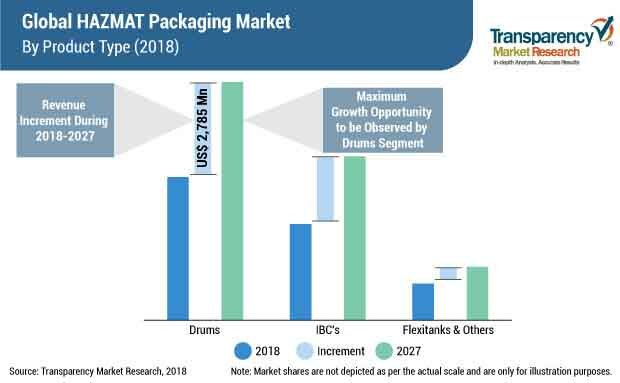 On the basis of product, the HAZMAT packaging market study includes drums, industrial bulk containers (IBCs) and flexitanks, & other segments. Of these, HAZMAT packaging of the drums segment accounts for the major share of the global HAZMAT packaging market. This is primarily due to the cost-effectiveness offered by the drums as compared to IBC and other bulk containers. The material type considered in the HAZMAT packaging market study includes metal and plastic segments. Of these, the plastic segment in HAZMAT packaging accounts for the major share of the global HAZMAT packaging market. Being lightweight and cost-effective, plastic is preferred over metals such as stainless steel. On the basis of class, the HAZMAT packaging market has been segmented into nine classes. Of these nine classes, the class 3 segment will grow at a healthy CAGR in the global HAZMAT packaging market. On the basis of end use, the global HAZMAT packaging market has been segmented into seven segments that are chemicals & petrochemicals, oil & gas, freight and logistics, automotive, pharmaceutical, agriculture and horticulture, & other manufacturing industries. Of these, the chemical & petrochemicals segment in the global HAZMAT packaging market is expected to heavily dominate the market during the forecast period. The key manufacturers in the HAZMAT packaging market profiled in this report include– Greif Inc., SIA Flexitanks, Hoover Ferguson Group, Schutz Container Systems, Inc., Mauser Group B.V., HINRICH Industries, Thielmann US LLC, Eagle Manufacturing Company, Patrick J. Kelly Drums, Inc., Clouds Drums Dubai LLC., Balmer Lawrie & Co. Ltd., Sicagen India Ltd, Great Western Containers Inc., Fibrestar Drums Limited, Meyer Steel Drum, Inc., and Peninsula Drums Cc. Many local and unrecognized players are expected to contribute to the global HAZMAT packaging market during 2018-27. The key players in the HAZMAT packaging market are expanding through the strategy of introducing new US/DOT approved products and also by expanding through inorganic ways such as merger & acquisitions. Air Sea Containers has introduced a new product for the secondary packaging of HAZMAT goods. The company has introduced bags in a number of different sizes. These are suitable for transporting hazardous materials, including medicines as long as they are stored at a proper temperature. Hoover Ferguson Group has expanded its production capabilities and provides the highest quality standards in HAZMAT packaging as its products are DNV, BV, UN, and IMO certified. Also, some of its products include GPS asset tracking and remote liquid level monitoring. In this report, Transparency Market Research offers a 9-year forecast of the global HAZMAT packaging market between 2018 and 2027. In terms of value, the global HAZMAT packaging market is expected to expand at a CAGR of 5.8% during the forecast period. The study reveals HAZMAT packaging market dynamics in five geographic segments along with a market analysis for the current market environment and future scenario over the forecast period. This TMR report studies the global HAZMAT packaging market for the period 2019–2027. The prime objective of this report is to offer insights and key market trends pertaining to the global HAZMAT packaging market that gradually help transform global businesses. The HAZMAT packaging market numbers have been assessed by carefully scrutinizing the production of products used in HAZMAT packaging, in all five key regions for the current year, as well as the historical performance of the HAZMAT packaging market. Market size and forecast for each segment in the HAZMAT packaging market have been provided in the context of regional markets. All the segmentation for HAZMAT packaging has been considered after appropriate secondary research and revalidation of the data obtained through interviews with key thought leaders in the industry. The HAZMAT packaging market has been forecast based on constant currency rates. A number of primary and secondary sources were consulted during the course of the study on the HAZMAT packaging market. Secondary sources for data on HAZMAT packaging trade include company annual reports & publications. The global HAZMAT packaging market report begins with an executive summary intended to give a clear perspective about the market to the reader. It is then followed by a thorough definition of HAZMAT packaging and the market segmentation describing the scope of the study. This is to outline the significance of HAZMAT packaging as a product, and the impact of their market growth on the industry. The Porter’s Analysis section ensures a thorough understanding of the level of competition in the HAZMAT packaging market. Porter’s Analysis for the global HAZMAT packaging market has been covered for bargaining power of suppliers and buyers, threat of substitutes and new entrants, and the intensity of competition. This is followed by market dynamics and an overview of the global HAZMAT packaging market, which includes TMR analysis of market drivers, restraints, trends, and opportunities that are affecting the growth of the HAZMAT packaging market. On the basis of product, the HAZMAT packaging market study includes drums, industrial bulk containers (IBCs), and flexitanks & other segments. Of these, HAZMAT packaging of the drums segment accounts for the major share of the global HAZMAT packaging market. This is primarily due to the cost effectiveness offered by the drums as compared to IBC and other bulk containers. The material type considered in the HAZMAT packaging market study includes metal and plastic. Of these, the plastic segment in HAZMAT packaging accounts for the major share of the global HAZMAT packaging market. Being lightweight and cost-effective, plastic is a more preferable material over metals such as stainless steel. On the basis of classes, the HAZMAT packaging market has been segmented into nine classes. Of these nine classes, the class 3 segment will grow at a healthy CAGR in the global HAZMAT packaging market. On the basis of end use, the global HAZMAT packaging market has been segmented into seven segments that are chemicals & petrochemicals, oil & gas, freight and logistics, automotive, pharmaceutical, agriculture and horticulture, & other manufacturing industries. Of these, the chemical & petrochemical segment in the global HAZMAT packaging market is expected to heavily dominate the market during the forecast period. The next section of the report highlights the HAZMAT packaging market by region and provides the market outlook for 2018–2027. The report evaluates the present scenario and growth prospects of the regional HAZMAT packaging market for 2018–2027. The next section of the report highlights the HAZMAT packaging market by region and provides the market outlook for 2018–2027. The study investigates the regional year-on-year (Y-o-Y) growth of the HAZMAT packaging market. The key regions assessed in this report include North America, Latin America, Europe, Asia-Pacific (APAC), and the Middle East & Africa (MEA). The report evaluates the present scenario and growth prospects of the regional HAZMAT packaging market for 2018–2027. To ascertain the market size in terms of value and volume, the revenue generated by the key manufacturers of HAZMAT packaging and their respective production capacity is taken into consideration. The forecast presented here assesses the total revenue generated by value across the HAZMAT packaging market. In order to provide an accurate forecast, we started by sizing up the current market, which formed the basis of how the HAZMAT packaging market is expected to develop in the future. To understand the key growth segments in terms of growth and adoption of HAZMAT packaging globally, in the final section of the report, a ‘dashboard view’ of the companies is provided to compare the current industrial scenario and their contribution to the total HAZMAT packaging market. Moreover, it is primarily designed to provide clients an objective and exhaustive list of manufacturers in the HAZMAT packaging market. A detailed comparative assessment of key providers specific to a segment in the HAZMAT packaging market is also included. Report audiences can gain segment-specific manufacturer insights to identify and evaluate key competitors in the HAZMAT packaging market.